A guest post written by Zoe Scholtz, who shares her incredibly inspiring story of fighting the odds to overcome adversity and emerge stronger for it. Like me, she has found an unexpected sanctuary in running and is truly living the Reaching Aspiration ethos. I am honoured and privileged that she has allowed me to share her story. I contracted a viral infection in July 2015. The doctors ran every test in the book, but up until today, I still have no definite answer of what was actually wrong with me. Encephalitis, meningitis, septicaemia, jaundice, and probably a whole host of other scary sounding illnesses, are some of the adjectives used to describe what was potentially wrong with me. I ended up in the Intensive Care Unit and was in a coma for about 10 days. I remember waking up in a normal ward in the hospital, looking around me and wondering what had happened. I have absolutely no recollection of the preceding 10 days. No memories, nothing. It was weird, I had no idea what time of the day it was, nor what day of the week, date of the month even. What??? What just happened now? I remember thinking to myself, “NO”. Not having any recollection of my days in ICU, I couldn’t really empathise with my friends and family who had been to hell and back. In fact, in my head, there was nothing wrong with me really, just feeling a bit on the weak side. We won’t go into depth the part where, initially, I could barely make it from my bed to the toilet and back again. Rather let’s skip ahead to a day or two later, when I eventually became pretty competent at going to the toilet on my own, however, in order to be released from hospital I apparently had to be able to walk around the nurse’s station. From my hospital bed to the nurse’s station and back again couldn’t have been much further than a couple of hundred metres, if that. One morning, a friendly blonde lady (I think she was a physiotherapist) arrived and helped me get out of bed. Armed with my “beepy” machine with all those scary bags attached, and clutching the back of my hospital gown (trying not to moon anyone), I managed to walk from my bed all the way around the nurse’s station and back. Having never run very far in my life, my framework of reference is limited in this regard, but I remember thinking to myself – wow – it feels like I just ran a marathon. I made it around the nurse’s station, and I was now free to go home. Awesome, now my life can go back to normal. Um, no not quite. I was booked off work for another 2 (maybe 3) weeks. I apparently had some sort of seizure in the hospital, so I was not allowed to drive. There was also a very irritating ringing in my ears (no, not my mobile phone, but a bad case of tinnitus). Then for the bit that was particularly tough on all those who loved me. Something up there in my ears seemed to have gone loopy, and this impacted my balance badly (I could walk backwards fine, but forwards was a challenge – kind of like life in a way). I also didn’t take kindly to assistance, so my family had to watch me walk (actually more like stumble) around like a very drunk person. Next, I was off to step down care for one week. One week is what I promised my husband I would do, and then we could discuss my return to work plans. Step down care started off with a whole bunch of stuff, including occupational therapy (my handwriting has never been beautiful, but now it was horrendous), hearing specialists, and physiotherapy. After the first two days of my one week commitment, the various specialists decided I was on the mend and would be fit to take my place back in society. I ended up spending the rest the week with the physio. Each morning I had to take a walk, either with the physio, or with her helper. I remember having a spectacular pity party on the Tuesday. I have always been an advocate of allowing yourself one of those days when you feel like you really need it. But only one, mind you, after that you need to deal with whatever it is that made you feel sad and sorry for yourself. Life moves on, whether you are present or not. After this week of physio therapy I was referred to a bio-kineticist, who also required me to walk every day as part of a series of exercises designed to improve my balance issues. I very diligently went for my walkies (about 3km) every day, rain or shine, cold or hot. It didn’t help that it was July, so in South Africa, the weather tended to be on the cold or very frosty side. A big jacket, beanie and gloves became my standard uniform for my sojourns out of the house. I had a little routine going, and made sure that my walk and my prescribed exercises were done early in the morning. I loved watching the sun come up, it almost seemed like a special reward for getting out of bed early. This left me with the rest of the day to do productive stuff like reorganise the spice cupboard and filing, until everyone (including my very worried husband) agreed that I was able to return to work on 3 August 2015. Ever competitive with myself, I eventually became frustrated with walking and decided to try jogging (having detested running, at school I was usually last or close to last in athletics, and generally pretty uncoordinated). Initially I could only jog about 500 metres before I wanted to die and had to walk again. I persisted though and eventually was able to jog the entire 3km of my walking route. I then aimed to be able to run 5km, which I managed to achieve towards the end of last year, albeit very slowly! In May 2017 I attended my very first parkrun. 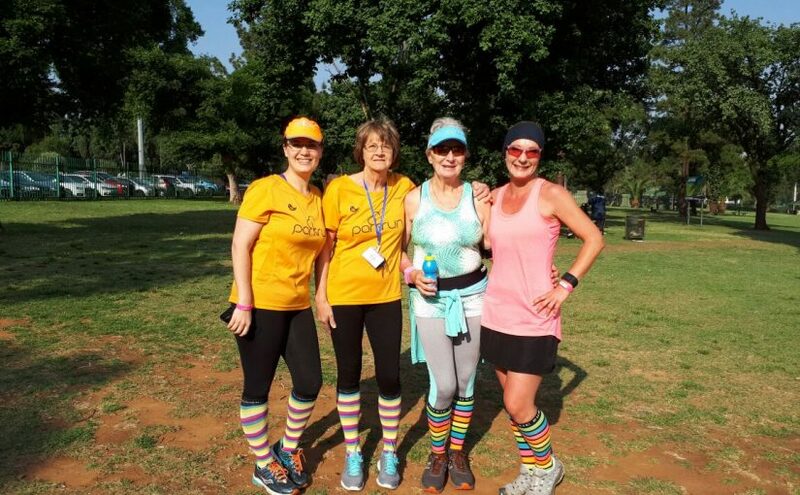 I am now a very loyal and dedicated parkrunner and recently achieved parkrun tourist status (that’s for having run at least 20 different parkrun events in South Africa). 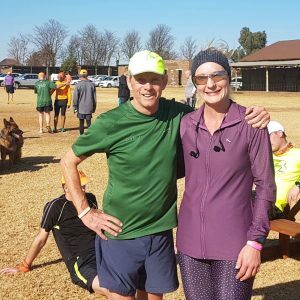 One of my most treasured memories of 2017 is running the whole of the inaugural Lanseria parkrun with the legendary Comrades marathon runner, Bruce Fordyce. I have a way to go to achieve the 50-parkrun club status (you get a red T-shirt for that 😊) and I am aiming to achieve that early next year. I am also pretty proud of my latest PB for 5km (25:21) achieved at Victoria lake parkrun. One of my goals is to do a sub 25-minute 5km, and I am training hard to get this right. Around April of 2017 I started running 10km and have recently entered a 21km, let’s see how that goes. I am a bit concerned about 21km (its far, and I have no idea what I am doing), I joined the local running club, and have been training very hard the last couple of weeks. One day I hope to be able to complete a full marathon, perhaps next year. Life is about balance and focus. If you lose your focus point, you will fall over (try standing on one leg with your eyes closed and see how long you stay upright). Running has taught me about setting goals, commitment and dedication. This is the one sport where you are competing against no one but yourself. That is quite scary actually as I never realised how much I was capable of. Perhaps I was too scared to find out. Never allow other people to label you. That neurologist that told me I would probably only ever be 70%. No, I will not allow that to be the case, I want to be more than 100% of what I can be. Running and life are very similar. Keep putting one-foot in front of the other. The gift of health is something we take for granted until it is gone. There is no price for good health, or for the honour to be able to get out of bed early in the morning. I love my morning runs, watching the sun come up will forever remind me of how blessed I am and how precious life is. Inspired by Zoe’s story? Have an aspirational story share with us? – Please get in touch.